Wow! 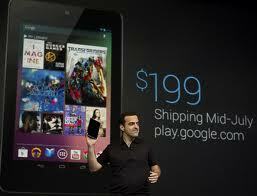 Just when you think the tablet wars are over along comes Google with the Nexus 7. Many think that it will not be a serious contender to Apple’s iPad which currently owns 60% of the market, but only time will tell. It is smaller, and it does lack a rear facing camera, however it is also much cheaper. Affordability in a tight economy can make a huge difference for a lot of consumers. The other thing to consider is that it is no longer just about the hardware. There is an entire eco system behind each of these tablets. Amazon’s Kindle Fire has all the books, movies, music, etc., fuelling sales of its tablet, iPad has the iTunes store, and a host of inter-connected devices. And now Nexus 7 has the world of Google with an amazing array of apps, books, movies, magazines, and other services behind it. With a company of the magnetude of Google behind this product, it will certainly be a serious contender in the tablet market regardless of what the nay-sayers think. There is so much value add to purchasing a Google product that the hardware it self is only half of the equation. Google’s marketing may not be as cool, slick, or as hip, as Apple, but the launch of a high-end tablet, at less than half the price of an iPad, in a difficult economy, is pretty smart I think. In fact, at that price I may even buy one myself!